This is a fascinating one. 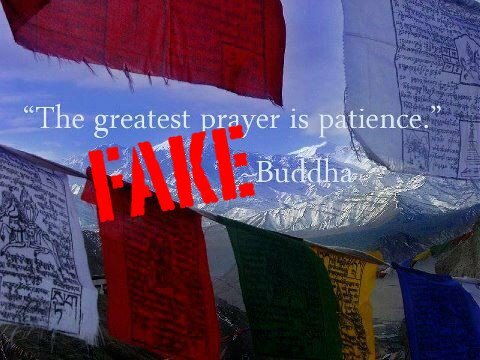 I’d never come across “The greatest prayer is patience” attributed to the Buddha or otherwise. Fortunately “Syamophile” brought it to my attention saying that he or she had seen it on many sites, including this one. I immediately thought of the 184th verse of the Dhammapada, “Patience is the highest asceticism,” based on the similarity of phrasing. “Bad translation?” was my thinking. Sure enough, it’s quite common. And old. And it does turn out to be a bad translation, although by an interesting route. Before we go any further, this is actually a translation of a fragment, the original Pali verse being “Khantī paramaṃ tapo titikkhā.” The extra word, titikkhā, means both endurance and forgiveness. Khanti and titikkhā are both the subjects of the sentence, which could be translated as “Patience and forgiveness is the highest ascetic practice.” But what did the Buddha mean by this? In the Buddha’s day there was a strong, although by no means universal, current of belief that ascetic practices could purify past karma and free the mind from the passions, which were associated with the body’s needs. Dealing patiently with the pain of ascetic practices could be a way of “atoning” for past bad actions, and also could demonstrate the mind’s mastery of the body’s appetites. Some non-Buddhist schools believed that liberation could be attained by mortification alone. The word tapo comes from a root meaning to heat, and in fact one form of ascetic practice involved exposing oneself to extreme heat by sitting surrounded by fires at the hottest part of the day. This sounds crazy, but many people today will sweat buckets in a sauna, swearing by its “purifying” effects, and thinking that poisons will be sweated out of the body. Other forms of ascetic practice included starving oneself, holding one’s breath, standing still for prolonged periods, and even (horror of horrors) bathing three times a day. The Buddha is reported to have tried many of these ascetic practices before his awakening, and found that all they did was weaken his body almost to the point of death. So he gave them up. That was one approach. The other was to attempt to redefine tapo. The Buddha, in saying that “patience is the highest form of asceticism” is playing a trump card. Why seek out pain, when pain comes to us? Isn’t patient and equanimous acceptance of life’s inevitable pains enough? It was a good argument, but it wasn’t apparently enough to stop asceticism from becoming an established part of Theravadin Buddhism, in the form of the 13 dhutangas, which go a bit further than the Buddha’s (or rather Devadatta’s) five points allow.